Although still not quite well known in the Western world, bitter melon is a medicinal fruit with a long history of use in Ayurvedic medicine, traditional Chinese medicine, and in some of the healthiest places in the world like Okinawa, Japan. There is a good reason for this. For instance, the Chinese were attracted to the bitter melon’s sour taste. They began using it for fruit recipes and juiced it for tonics used to treat skin wounds, upset stomach, indigestion, coughs, and other respiratory infections. Bitter melon nutrition is also very impressive and is loaded with vitamin C, folate, vitamin A, fiber, potassium, and more beneficial nutrients. As a result, it has been the focus of more than 100 clinical studies where researchers found it can protect against cancer, manage blood sugar levels and diabetes, as well as reduce respiratory infections like pneumonia. It can also reduce menstrual irregularity and treat gout, kidney stones, jaundice, autoimmune disorders, and digestive symptoms. It sounds like bitter melon is powerful medicine. You likely wish you heard of it sooner. Read on to find out more about it, including its history, nutrition facts, health benefits, and how to use it. Bitter melon comes from the Momordica charantia plant, and the edible fruit is native to Africa, Asia, and parts of the Caribbean. It belongs to the Cucurbitaceae plant family and is in the same family as the cucumber, watermelon, squash, and cantaloupe. Two of its varieties are mostly grown for medicinal purposes—M. charantia var. muriacata and M. charantia var. charantia. Other names for bitter melon include bitter gourd, bitter apple, balsam pear, la-kwa, cundeamor, carilla fruit, and it is called ku gua in Mandarin. The most commonly grown plants will produce a small and round fruit with a very distinct sour taste. The bitter melon also has a deeply rooted history, especially in African and Asian folklore. It has held a key place within healing systems native to Turkey, Japan, India, and Indonesia for approximately 700 years. Bitter melon is considered one of the most important plants for India’s Ayurvedic medicine. Ayurveda uses the fruit as a natural laxative for constipation, treating skin wounds or disorders, balancing hormones, reducing digestive issues, and managing diabetes symptoms. For hundreds of years, bitter melon has been used in the treatment of various diseases in developing countries, including Peru, Panama, Malaya, Nicaragua, Mexico, Ghana, Haiti, Cuba, Colombia, China, and Brazil. This is likely due to its low cost, availability, and its many uses. It is still used as a popular vegetable in several Asian countries, including Bangladesh. As mentioned, bitter melon is an excellent source of nutrition. What are bitter melon nutrition facts? A one cup serving of raw melon contains 10% of the recommended daily amount of fiber and a whopping 130% of the daily recommendation of vitamin C.
The fruit is also an excellent source of folate, vitamin A, and potassium while containing trace amounts of vitamins B1, B2, B3, B5, B6, calcium, iron, magnesium, zinc, copper, selenium, and manganese. Research has also identified at least 32 active chemicals in bitter melon. For example, a type of alkaloid called momordicine is responsible for giving the melon its sour flavor. It is also full of active antioxidants and phytonutrients, especially saponins, alkaloids, glycosides, phenolic acids, triterpenes, fixed oils, insulin-like peptides, and various anti-inflammatory steroids and proteins. The following is a comprehensive nutrition chart with information for one cup of diced bitter melon or 93 grams (g) of the fruit. What are the health benefits of bitter melon? Studies have found that specific flavonoid and phenolic compounds within it are responsible for many of its anticancer and antidiabetic effects. Some of these compounds include tannic acid, gallic acid, caffeic acid, catechin, gentisic acid, p-coumaric, epicatechin, and chlorogenic acid. As a result, bitter melon can balance hormones, reduce inflammation, prevent obesity, regulate appetite, and prevent tumor growth. For example, various studies have found that certain anti-inflammatory and antibacterial compounds in bitter melon can treat skin problems like psoriasis, eczema, wounds, and abscesses. Several investigational reports suggest that bitter melon can decrease body weight in obese animals fed a high-fat diet. The supplementation significantly prevented weight gain and visceral fat mass. As a result, bitter melon may prevent obesity and symptoms related to cardiovascular disease and metabolic syndrome like high blood pressure and high cholesterol. The following is further detail about bitter melon health benefits. Both animal and human studies have found that bitter melon extract can reduce blood sugar levels and regulate how the body uses insulin. More than 100 studies have found that it can help manage diabetes symptoms and complications including high blood sugar levels and insulin resistance, as well as kidney damage (nephropathy), eye disorders, heart complications and blood vessel damage, and hormonal irregularities and menstrual changes in women. A study published in the Journal of Agricultural Food Studies in 2013 found that bitter melon consumed in both juice or raw form helps reduce blood glucose levels in diabetic and healthy animals. The fruit targeted insulin receptor sites and stimulated downstream pathways, which led the researchers to conclude that it can regulate glucose metabolism. That said, other research shows that the positive effect depends on the individual. More research has identified the active constituents in bitter melon as responsible for its antidiabetic effects. These include steroidal saponins called charantins and insulin-like peptides and alkaloids. Research shows that bitter melon contains several antibacterial and antiviral agents capable of reducing the susceptibility to infections like Helicobacter pylori and viruses like HIV (human immunodeficiency virus). A review published in the International Journal of Microbiology in 2014 stated that bitter melon powder has been used for centuries in Ayurveda for ulcers and wound healing. The melon’s extract also reduced ulcer symptoms significantly in aspirin and stress-induced ulcers in rats. Furthermore, studies have also identified antiparasitic compounds in bitter melon that help expel parasitic worms and other parasites from the body. Bitter melon extract has been found to prevent liver disease, improve liver function, decrease kidney stones, reduce intestinal and stomach disorders, decrease inflammatory bowel disease symptoms, treat parasitic worms, and improve overall digestive health. It was also traditionally used to reduce ulcers and stomach pains. As a natural laxative, it can also help relieve constipation. Research published in Evidence-Based Complementary and Alternative Medicine in 2011 found that bitter melon extract increased glutathione peroxidase (GPx) levels, catalase, and superoxidase dismutase, which help prevent liver damage and improve detoxification. Various studies have found that bitter melon is effective in preventing certain cancer types, including bladder cancer, Hodgkin’s disease, carcinoma of the tongue and larynx, prostatic cancer, skin tumors, breast cancer, melanoma, choriocarcinoma, lymphoma, and lymphoid leukemia. A report published in Current Molecular Medicine in 2011 detailed over 20 active components of bitter melon that have antitumor properties. The research team concluded that it has antitumor compounds, and it deserves future clinical investigation. Bitter melon extracts have also been found to promote detoxification and inhibit free radical damage, which promotes tumor growth and cell mutation. In traditional Chinese medicine, bitter melon juice is used specifically for treating bronchitis, dry coughs, and throat problems. It can prevent coughing, colds, and the flu through its ability to increase detoxification, reduce inflammation, lower free radical damage, and improve blood flow. After all, the expectorant, suppressant, and antihistamine properties make it ideal for improving respiratory health. Studies also show that bitter melon juice, seeds, and fruit can help prevent food allergies, mucus, coughing, and respiratory illnesses. How do you use the bitter melon? It is sometimes used as a vegetable and added to stir-fries and other recipes, including throughout Asia. Traditional Asian meals call for bitter melon paired with garlic, onion, potatoes, and chili. You can consume bitter melon cooked or raw. You will want to look for fruit that is firm, green, and free from splitting or bruising. Store your bitter melon at cool temperatures and ideally in the refrigerator. It will store for one to two weeks, or until spots start to form on its green color. Interested in drinking bitter melon? You can safely consume up to 100 milliliters of fresh bitter melon juice per day. To cut the bitterness, add some honey or juice from a different fruit or vegetable. Bitter melon can also be used in a concentrated extract, capsule, or tablet form. The best dosage of the extract will depend on the condition being treated. Research shows that 1,000 to 2,000 milligrams each day has the best effects. It is often recommended to split the dosage into two or three servings, while absorption is improved when taking capsules after a meal. For management of blood sugar and diabetes, the general recommendation is one or two capsules, three times daily after a meal, and up to a three-month period. You will want to look for purest form of bitter melon extract in capsule or tablet form. It will ideally be magnesium stearate-free, gluten-free, non-GMO project verified, certified organic, and free from synthetic additives. There is not much to be bitter about bitter melon. Again, science has shown that bitter melon is excellent for balancing blood sugar, fighting bacterial and viral infections, preventing cancer, improving liver or digestive conditions, reducing respiratory problems, treating wounds and skin inflammation, and preventing heart disease and obesity. At the same time, bitter melon is best when combined with other preventative measures of a good lifestyle, such as exercise and an overall healthy diet. There are also certain precautions to consider with this fruit. For instance, women who are pregnant, breastfeeding, or trying to become pregnant should avoid it. This is because research shows bitter melon can cause menstrual bleeding and miscarriages, while it also has antifertility capabilities. It is also wise to avoid bitter melon if you have been fasting, lost substantial blood, or have recently undergone surgery because it can cause side effects like fainting and dizziness. It is also important to note that although it can treat diabetes, it is best to talk to your doctor about using it in addition to your current treatment rather than replacing your drugs. Since bitter melon reduces blood sugar, it can interact with diabetic medications, and therefore careful supervision is recommended. Bitter Melon (ku gua),” Acupuncture Today; http://www.acupuncturetoday.com/herbcentral/bittermelon.php, last accessed July 28, 2017. “Bitter gourd (melon) nutrition facts,” Nutrition and You; http://www.nutrition-and-you.com/bitter-gourd.html, last accessed July 28, 2017. “7 Impressive Benefits Of Bitter Melon,” Organic Facts; https://www.organicfacts.net/health-benefits/vegetable/health-benefits-of-bitter-melon.html, last accessed July 28, 2017. 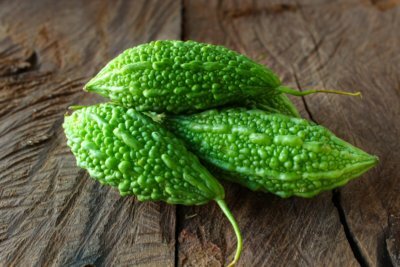 “Balsam-pear (bitter gourd), pods, raw Nutrition Facts & Calories,” SELF NutritionData; http://nutritiondata.self.com/facts/vegetables-and-vegetable-products/2319/2, last accessed July 28, 2017. “11 Major Health Benefits Of Bitter Melon,” NaturalON; http://naturalon.com/11-major-health-benefits-of-bitter-melon/view-all/, last accessed July 28, 2017. Fang, E.F., et al., “Bitter gourd (Momordica charantia) is a cornucopia of health: a review of its credited antidiabetic, anti-HIV, and antitumor properties,” Current Molecular Medicine, July 2011; 11(5): 417-436. https://www.ncbi.nlm.nih.gov/pubmed/21568930.